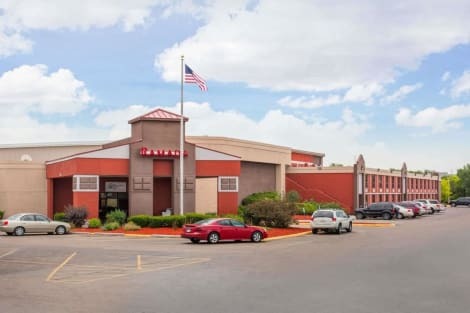 Located in Kearney, Ramada by Wyndham Kearney is within a 5-minute drive of Big Apple Fun Center and Trails and Rails Museum. This hotel is 1.3 mi (2.1 km) from Viaero Event Center and 1.6 mi (2.6 km) from Museum of Nebraska Art. Make yourself at home in one of the 121 air-conditioned rooms featuring refrigerators and flat-screen televisions. Complimentary wired and wireless Internet access is available. Private bathrooms with shower/tub combinations feature rainfall showerheads and complimentary toiletries. Conveniences include microwaves, housekeeping is provided daily, and cribs/infant beds (complimentary) can be requested. Make yourself at home in one of the 86 air-conditioned rooms featuring refrigerators and flat-screen televisions. Complimentary wired and wireless Internet access keeps you connected, and premium TV channels provides entertainment. Private bathrooms with shower/tub combinations feature complimentary toiletries and hair dryers. Conveniences include desks and microwaves, as well as phones with free local calls. lastminute.com has a fantastic range of hotels in Kearney, with everything from cheap hotels to luxurious five star accommodation available. We like to live up to our last minute name so remember you can book any one of our excellent Kearney hotels up until midnight and stay the same night.